When there was a contraption added to the top of the Everglades Hotel in December of 1948, observant Miami residents were left wondering what it represented. The most common speculation was that the mooring for the Goodyear blimp was going to be relocated to downtown Miami. The object in question was a steel shaft with three wired butterfly structures emanating from its base. It was a mystery to the inquiring mind. The addition to the Everglades Hotel tower represented Mitchell Wolfson’s move into home entertainment. At the end of 1948, Wometco, the company founded by partners Wolfson and Sidney Meyer in the mid-1920s, was doing very well with their empire of movie theaters. However, both men knew that that a significant change was coming in entertainment and they chose to lead the way. Figure 1: Antenna on Everglades Hotel in 1950. The addition to the top of the Everglades Hotel was a transmission antenna that allowed a new television station to broadcast video content from downtown Miami to as far as the northern boundary of Fort Lauderdale and an equal distance south. The antenna rose 306 feet above sea level and was fixed at the top of the hotel’s tower. While downtown residents were pondering the antenna at the Everglades, Wometco’s new television station built a small studio at 17 NW Third Street, which was a side entrance into the Capitol Theater. The address was the former location of the Birmy Photo Engraving Company from 1937 until 1947. The space was vacant in 1948 when the idea of a studio inside the theater was being planned. 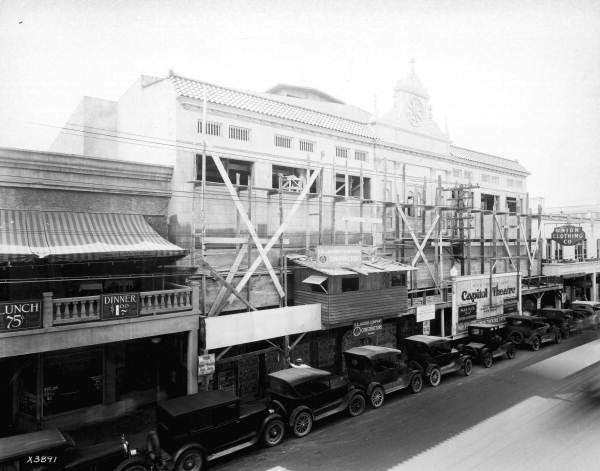 The Third Street entrance provided access to the studio without having to disrupt the foot traffic for the theater. In addition to the production facilities and stage, the studio offered a sixty-seat regulation theater for an audience to watch live programming. Wometco invested $500,000 and hired twenty-one employees to support what was considered a risky venture at the time. At the beginning of 1949, there was an estimated total of only two-thousand television sets in the Miami area and most were owned by businesses, restaurants and residents who were early adopters of the new medium. Only thirty-five televisions were sold in Miami during the first month in 1949, despite most Miami residents knowing that its first television station was coming online soon. Figure 2: Vladimir K. Zworykin with WTVJ executives on March 6, 1949. 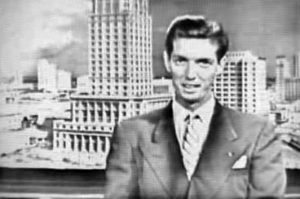 Despite the unchartered territory of telecast broadcasting, Bob Venn enthusiastically announced new developments in the launch of WTVJ. Venn was the general manager of the new station and one of three stockholders in the company at the time of launch. The other two were the co-founders of Wometco. On February 21, the station began sending its first test patterns so that television owners can calibrate their antennas to pick up the signal. The tests were conducted in the evening and began in short timeframes. Over the course of the next several weeks and with each successful trial, longer test patterns were broadcast to validate both the range and fidelity of the signal. On March 6, WTVJ got a visit from the country’s most famous television research scientist, Vladimir K. Zworykin. He had just come from giving a series of talks to the Cuban Engineering Society in Havana. Zworykin was the inventor of the electrical scanning method which made possible the transmission of video images, in the form of light energy, into home receivers. His ground-breaking invention enabled the early advancements in television broadcasting. Zworykin was very impressed with how fast WTVJ was able to begin sending test patterns from the time they got started. 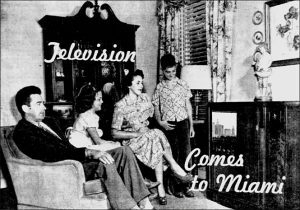 Figure 3: Family around TV set in 1949. From the beginning of their test period, Venn was targeting the third week of March as the official first broadcast. The team was on-schedule and was prepared to televise the first broadcast in the State of Florida on March 21, 1949. On the day of the historic event, a Miami News article stated that the total number of television sets in Miami were now estimated between 3,500 and 4,000 and the popularity of the new technological wonder was increasing as WTVJ got closer to its first telecast. Programming went on-air at 7PM with a series of short, pre-recorded, entertainment and news segments that lasted twenty-minutes. At 7:20pm, a twenty-minute sports reel preceded the dedication ceremony which was telecast exactly at 7:40pm. The ceremony included short speeches from political, church and civic leaders, as well as, executives from WTVJ. The remaining content aired on opening night were several pre-recorded shows that were provided by network affiliates. The shows included the Admiral Broadway Review (8-9PM), more entertainment and news reels (9-10PM), and then the Arthur Godfrey Show (10-11PM). Programming was done and the first broadcast ended at the conclusion of the Arthur Godfrey Show. Most of the content was pre-recorded in places like New York, Los Angeles or Chicago and flown into Miami. The dedication ceremony was the only live broadcast on the first night. However, the station had big plans to telecast “live” events during the course of their first year. 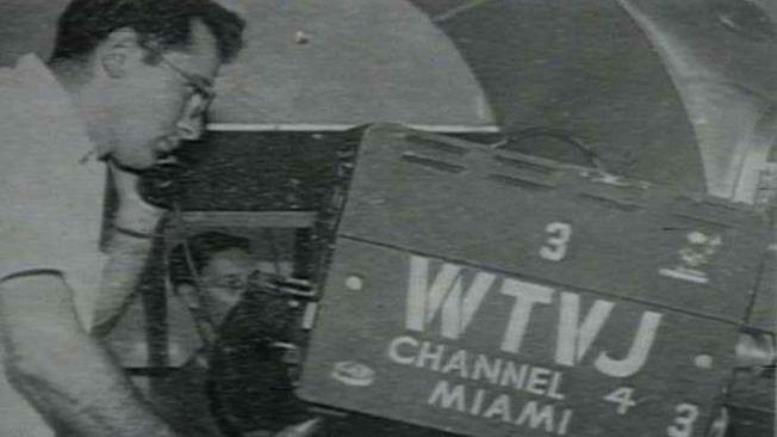 Noted Miami News writer William G. Baggs wrote an article reviewing the first telecast. He gave the event mixed reviews. He thought that the delivery of the pre-recorded shows from WTVJ’s network partners was decent, but the transmission could use some fine-tuning. Last night’s television debut was fair to middling as a first night performance, but it will have to improve to keep folks in other people’s living rooms during telecasting time. Most of the debut program was on film, jerky film, which was fuzzy and blurred too much of the time. Twice, the four-hour program jumped the tracks and the audience was left looking at a card which promised the station would soon be back on the video beam. The dedication ceremonies, in which public and civic leaders appeared before the TV screen, was embarrassing to many viewers. Most of these leaders approached the camera with great caution and stood with a suspicious eye cast toward the lens while they said their bit. The one exception to his criticism of the dedication ceremony was the performance of Mitchell Wolfson. He said that Wolfson “joked” and “felt very much at ease” in front of the camera. It was estimated that the viewing audience was between 30,000- 35,000 people based on the number of home sets installed and receivers that were available in restaurants and bars around town on the first night. Despite the curiosity and excitement around this new medium, Wometco executives said that they didn’t expect to make a profit for a few years. Figure 4: Miami Stadium in August of 1949. Although the station relied on pre-recorded content from network partners in its first year, Bob Venn was aggressive in signing agreements to telecast live events. On April 11, he announced that the station would begin telecasts of boxing and wrestling events. The first fights were broadcasted from the Coral Gables Coliseum. The early sporting events featured commentary from Matty Mathews, WTVJ sports director, and Roger Krupp, special events announcer. On August 11, Matty Mathews announced a deal with the Sun Sox to broadcast four games during the 1949 season. The first three games were telecast from Miami Field and the last one covered the events and game of opening day in the brand-new Miami Stadium on August 31. Mathews also struck a deal to telecast the home Miami Hurricane football games in 1949. The very first WTVJ broadcast from the Orange Bowl happened on September 30. The Canes beat Rollins College 52 – 13. When the Hurricanes played South Carolina on November 11, coach Andy Gustafson accepted WTVJ’s offer to place a television on the sideline so that his coaches can view the Gamecocks defensive and offensive alignments live so that his team can make tactical adjustments throughout the course of the game. The Canes beat South Carolina 13 – 7 on that night. Figure 5: Harry Truman in Miami on August 22, 1949. 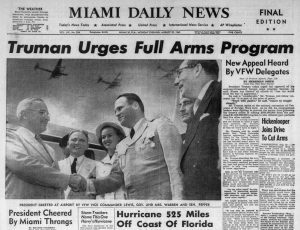 On August 22, WTVJ broadcast its first live political event when President Harry Truman came to Miami to give a speech to VFW conference attendees. The convention was held in the Dinner Key Auditorium and the speech was recorded by a lot of out of town television stations. However, only WTVJ was able to telecast the president’s oration to the local market as it transpired. The station also televised live election results on November 15 as 55,000 Miami residents went to the polls and set a new city commission election record. There were twenty-five candidates running for the five city commission seats. The weather cooperated and voters tuned into their television sets to find out who won their respective races. Television fans may see as well as hear the results, as WTVJ has scheduled shows at 8 and 8:30 p.m. originating directly from a room in the courthouse where the returns are being tabulated. When the University of Miami carried a special performance of Shakespeare’s ‘Comedy of Errors’, WTVJ was quick to suggest that the performance be televised. The play was conducted at the University’s Box Theatre on December 19. It was the first play televised in its entirety from a university stage in the south. The performance was an updated version of Shakespeare’s play and was introduced by Professor Fred Koch, head of the drama department at the University of Miami. The telecast also featured live interviews with audience members to get their opinion on the experimental performance. Since there were several television sets in the seating area, some audience members were able to watch both the live performance and the telecast at the same time. Figure 6: Orange Bowl on January 2, 1950. On December 18, it was announced that CBS would allow WTVJ to broadcast the Orange Bowl game on January 2, 1950, to the local market given that CBS did not have an affiliate in the Miami market. WTVJ was able to broadcast the game between the Kentucky Wildcats and the Santa Clara Broncos live as it began at 1:30pm eastern standard time, while the rest of the nation had to wait for CBS to fly the video back to New York to broadcast on delay in the evening. Santa Clara beat Kentucky 21 – 13 on that historic day in local television. It was estimated that up to 75,000 Miami residents had the ability to watch the live broadcast of the Orange Bowl. The calculation was based on the number of television sets in Miami at the time which was determined to be 17,000 by January of 1950. The 1950 Orange Bowl began a tradition of televising the New Year’s Day game to Miami residents from that point forward. Figure 7: Ralph Renick in 1950s. 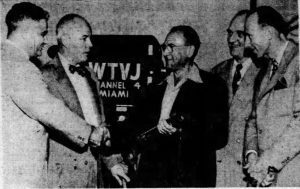 What seemed to be an uncertain experiment at the beginning of the year, the risk of launching WTVJ in Miami in 1949 was the right one at the right time. While Miami residents were reticent to purchase a television set at the beginning of the year, the number of sets available in the city jumped from 2,000 to 17,000 by the end of the year, and it was calculated that there was an average of 5.9 persons viewing each set daily. When the station telecasted its first broadcast in March, WTVJ was on the air six days per week for two hours a night. It did not televise on Tuesday evenings. It continued this schedule for the first four months of broadcasting. In an anniversary column about WTVJ in the Miami News in 1965, writer Agnes Ash observed that “broadcasting hours were less demanding than banking hours” during its first year. However, by mid-July, the station rolled out a twenty-four hour a week on-air schedule. It would double by the beginning of 1950. While Miami was fine with watching mostly pre-recorded content from the networks in 1949, it was WTVJ’s aggressive approach for live, local content, that kept viewers loyal even after competitors began to appear. The good fortune and innovation during the first year were a credit to the vision of its founders and the execution of the small team of station employees. The entire company hustled to ensure that television in Miami worked in 1949. However, it was when a skinny University of Miami graduate intern was promoted to news director in 1950 that WTVJ got a face. From that moment forward, “good night and may the good news be yours” became the optimistic maxim that WTVJ could count on until Ralph Renick’s sudden retirement in March of 1985. While the channel number and the people have changed since its founding in 1949, WTVJ celebrates its seventieth year in business on March 21, 2019. The business has changed a lot in seven decades, but the station continues to keep the Miami metropolitan area informed and entertained despite the challenges of navigating so many new options in home entertainment. Cover: WTVJ Camera Man in 1949. Courtesy of WTVJ. Figure 1: Antenna on Everglades Hotel in 1950. Courtesy of Miami News. Figure 2: Vladimir K. Zworykin with WTVJ executives on March 6, 1949. Courtesy of Miami News. Figure 3: Family around TV set in 1949. Courtesy of Miami Archives. 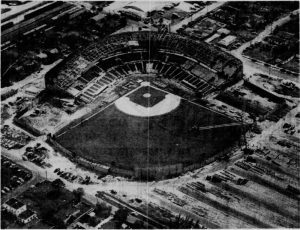 Figure 4: Miami Stadium in August of 1949. Courtesy of Miami News. Figure 5: Harry Truman in Miami on August 22, 1949. Courtesy of Miami News. 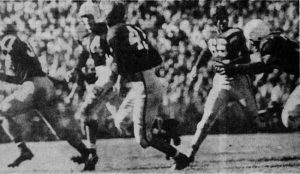 Figure 6: Orange Bowl on January 2, 1950. Courtesy of Tampa Bay Times. Figure 7: Ralph Renick in 1950s. Courtesy of WTVJ. 1 Comment on "WTVJ Eventful First Year in 1949"
Great article! And Happy 70th, WTVJ!